After five weekends of work, [Alex] completed his automatic drink maker, the RumBot. What makes this automated bartender different from others is the fact that it is fast. VERY fast. It can serve drinks to five different locations in as little as 3 seconds per drink. By [Alex]‘s estimation, this could keep a party of 100 people going without anyone waiting on a drink. The RumBot can make either of five pre-programmed drinks at varying levels of alcoholic intensity, ranging from 1 (“Virgin”) to 10. And for that extra push over the cliff, you can turn the knob to 11 (“Problem”). Drink selection itself is handled by a simple digital I/O on an Arduino with a 1950s-styled user interface. The frame is built out of wood and uses 3D Printed plastic parts. It houses a very robust servo on a belt stage to move the drink nozzle, and special sensors placed at either of the five drink locations detect a cup ready to be filled. Any cup placed at any of the positions will automatically be filled based on the RumBot’s settings at any particular time. Based on the quality of the build and the increased speed of this automatic drink maker, this should be a huge hit at any party. With all the knobs turned to 11 though, it might be a good idea to have a breathalyzer on hand! All of the code and schematics for the project are available at the project site as well. You can certainly buy a ready-made drink mixing robot if you're flush with cash, but wouldn't you rather spend that money on the drinks themselves? 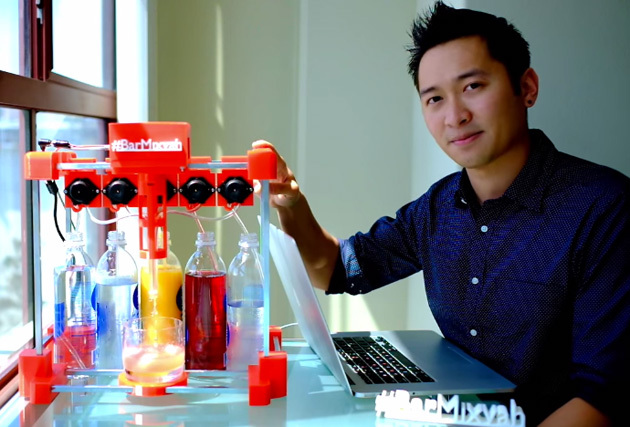 Yu Jiang Tham thinks so -- he recently designed Bar Mixvah, a robotic bartender you can build yourself with $180 in parts. The key ingredient is an Arduino Nano microcontroller that takes your requests through a web-based interface. After that, it's mostly a matter of 3D printing the frame and wiring up the pumps that will make your beverage a reality.